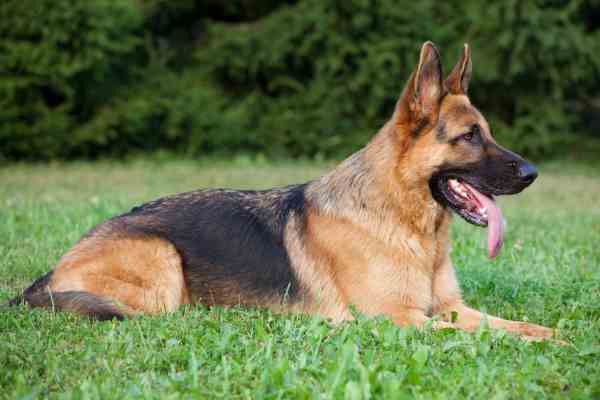 It's no wonder that German Shepherds are consistently one of the most popular dogs. 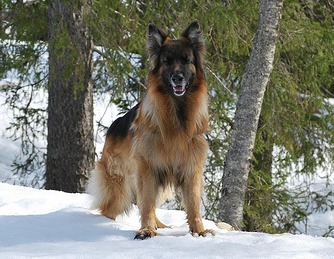 With their even-temperament, unwavering loyalty and extreme intelligence, they do make fantastic dogs to own. 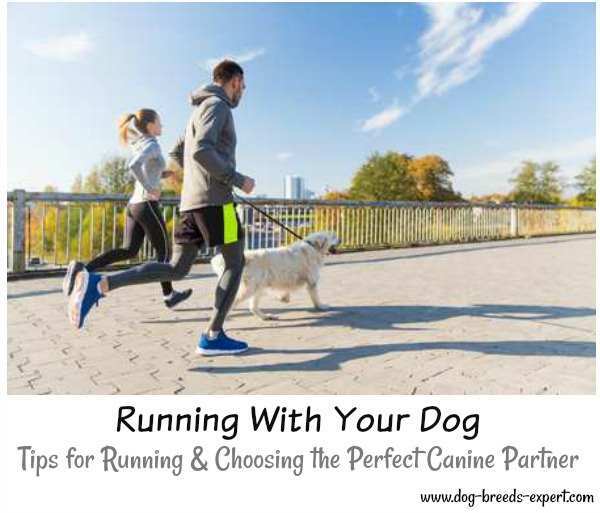 Provided they are socialized properly from an early age, this breed will get on with other household cats and dogs although due to their herding roots, they can have a strong chase drive. 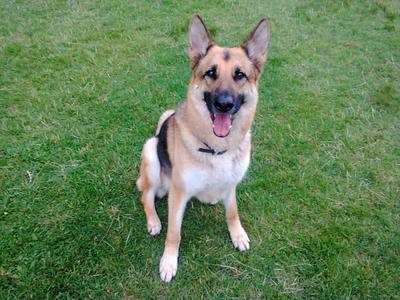 They make great family dogs and form a close bond with their owners especially those who are looking for a sensible, obedient dog. A few decades ago they were rather unfairly portrayed as more aggressive than they really are and received a bit of bad press but thankfully people seem to be realizing that those images were not the true German Shepherd. They require a great deal of exercise though so are not suitable for apartments or the frail and elderly who cannot get out to exercise much. 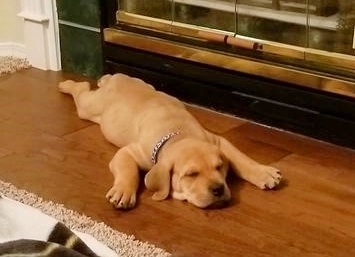 Due to their high intelligence, this breed needs to have mental as well as physical stimulation or they will become disruptive and will bark excessively. Definitely not a dog to be left shut indoors alone all day - that's just too unfair. 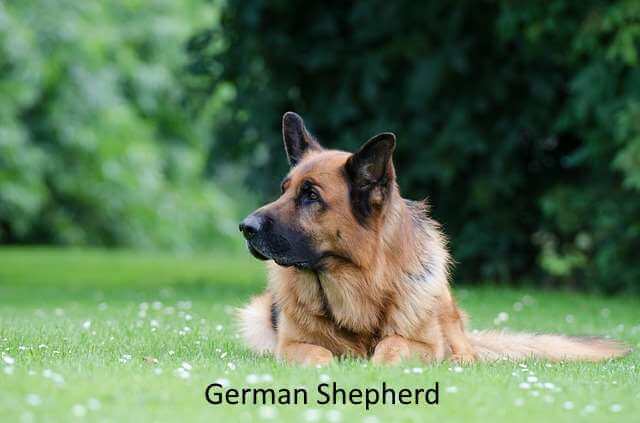 The German Shepherd originated in Germany as a herding dog and was used to herd and guard sheep but has since gone on to be one of the most recognisable breeds in the World. They date from around 1899 when they were first shown in the show ring and were introduced into the UK and the USA just after World War I. 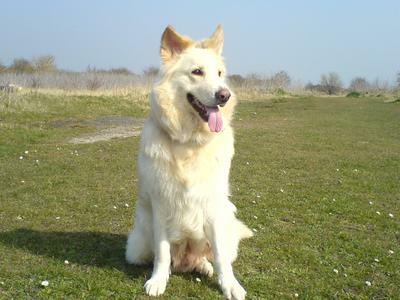 Because of World War I and the immediate years afterwards, there were concerns that the dog's popularity would suffer due to having the word "German" in their name so a decision was taken by the UK Kennel Club to instead call them an "Alsatian Wolf Dog" and this name was soon adopted by other international kennel clubs although the "Wolf Dog" part eventually got dropped. 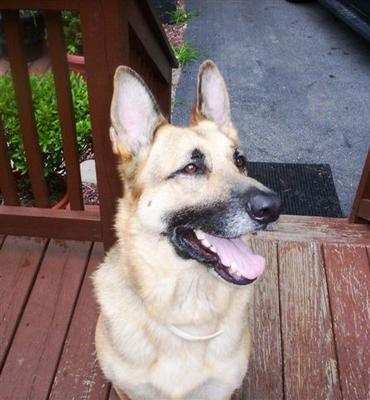 Lovers of the breed campaigned to have the name returned to "German Shepherd" and they finally got their wish in 1977. 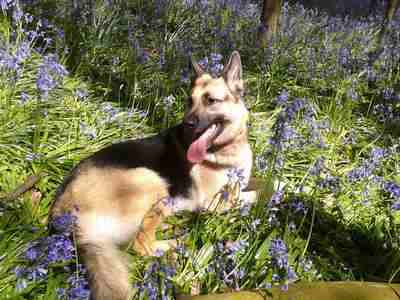 In 2010, the word "Alsatian" was finally removed completely from the formal breed's name in the UK. 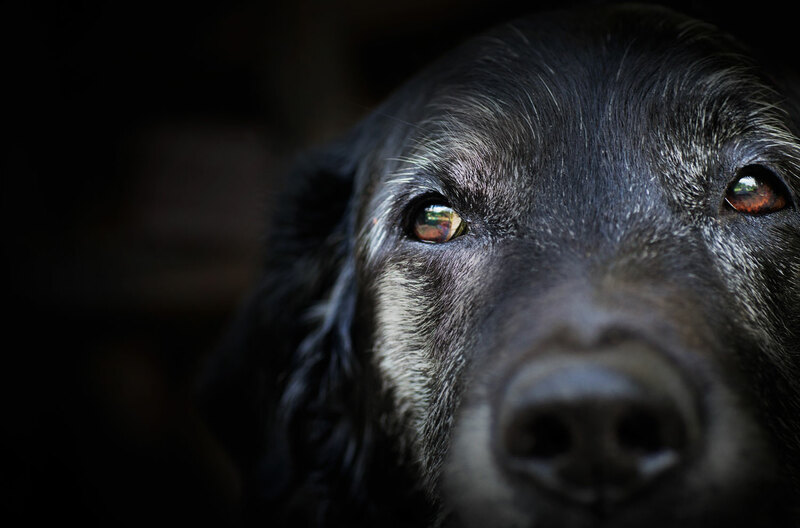 At one point, most guide dogs for the blind were German Shepherd dogs due to their willingness, sense of loyalty and intelligence however this has now been overtaken by the Labrador and Golden Retriever, although they are still used. They are also still used a military dogs and have even been taught to parachute out of aircraft! This breed has an excellent sense of smell and are frequently used in search and rescue missions, as drug sniffer dogs and as bomb/landmine detection dogs. What a dog! 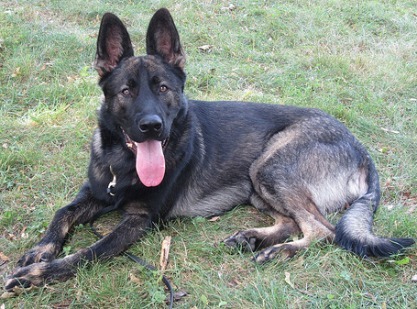 Scoring third in the "Intelligence Of Dogs" Test (behind Border Collies and Poodles), German Shepherds are highly intelligent and pick up new commends quickly. 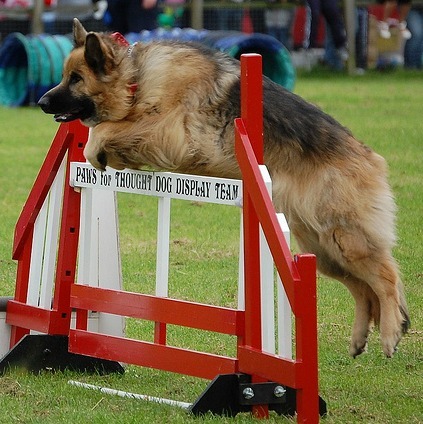 They excel in competitive obedience trails and in agility. They are very responsive. This athletic companion requires a considerable amount of exercise and cannot be left indoors all day. At least one long walk a day coupled with ample time to run safely off lead and play is what this beautiful dog requires. Some people like to use a dog harness like the ones opposite as they feel it's more comfortable for their dog than having something around their necks. If it's good enough for the Police Force and Military, then it's good enough for us! These guys have been used for decades as guard dogs. They are courageous, protective and loyal without being overly aggressive although the all-white varieties tend to show a bit more aggression than the other colours. 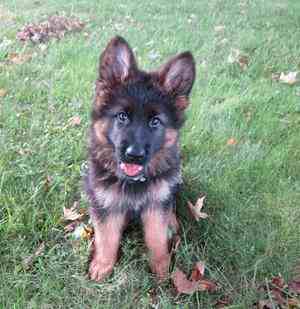 German Shepherd dogs have a double coat. The outer layer is straight, harsh and waterproof and the undercoat is soft and dense. The outer coat sheds throughout the year. These long-haired dogs require daily brushing and grooming, with the occasional bath. We recommend FURminators for grooming - we have one and they are truly amazing! The amount of hair they remove is astounding and your pet looks like they've been professionally groomed afterwards. A big thumbs up from us! But what happens when they blow their coat? It is a term used by breeders and other enthusiasts to describe a dog who looses the entire undercoat in one fell swoop. All the hair that makes up the undercoat comes out in large clumps and this all happens in less than a week. It is basically a seasonal molt that happens in the Spring and Autumn. During this time, brushing must be done daily until the last of the undercoat has been shed. This could take up to two weeks. All the dead hair is shed to make room for new. If you don't brush or remove the hair, it will become matted and then you really have a big mess. Beyond the coat care, these dogs need to have their nails clipped and their teeth brushed. These dogs are also prone to ear infections, so check the ears every time you brush and clean if necessary. A six year old lad who is silent and proud. He is extremely loyal to his pack has a no bull approach to strangers. On the flip side Blaze is a wonderful family dog training is everyday he is so eager to learn and please. But we must understand that the GSD is a mindful dog and as such if he does not see a purpose to your request the chances of him acting out your request is slim. So with all training there must be a beginning a middle and an end. Yes the WGSD is a more prey driven dog than its different coloured stable mates. And as such in my opinion the best guard dog but is also the best family dog. As he will lay down his life for you. 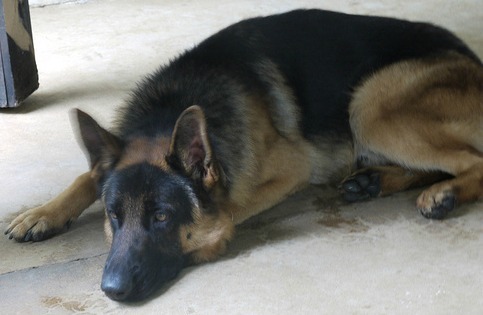 Bandit is My German Shepherd, He is black and Tan. Bandit has been with me for about 10 Years now. I can tell he is getting a little slower then before. But the thought of putting him down one day is very hard. Bandit is great with my five children and Carlos the cat. Yes, Carlos, the two of them are the best of friends. They clean each others ears and body! It's funny to watch. All put in a nut shell, Bandit, Takes very good care of us, and we take very good care of him. He makes sure that he lets us know when someone comes into our yard, that shouldn't be there. (BY BARKING) loves his car rides, pool, and yes, He loves to run after the tree rats. He's a complete mummy's boy and loves nothing more than having kisses and cuddles! He plays with my 11 month old son and is very protective of him. Kaiser constantly makes sure he is in front of us and our child when out - We believe he likes to state "They are MY family!" He also plays with our cat! His best friend is our friend's border collie and will accept any other dog/person into our house as long as he sniffs them first haha!